Sometimes all of the factors needed to make a great photo come together and you end up with a portrait like the one above. We have received rave reviews for this particular image and as I look at it again, I realize that circumstances beyond a photographer's control will often aid in making a great shot. Sure, most photographers will tell you that they plan every great shot and controlled all of the factors. The truth is we all are looking for that perfect moment and it doesn't always occur without some luck. 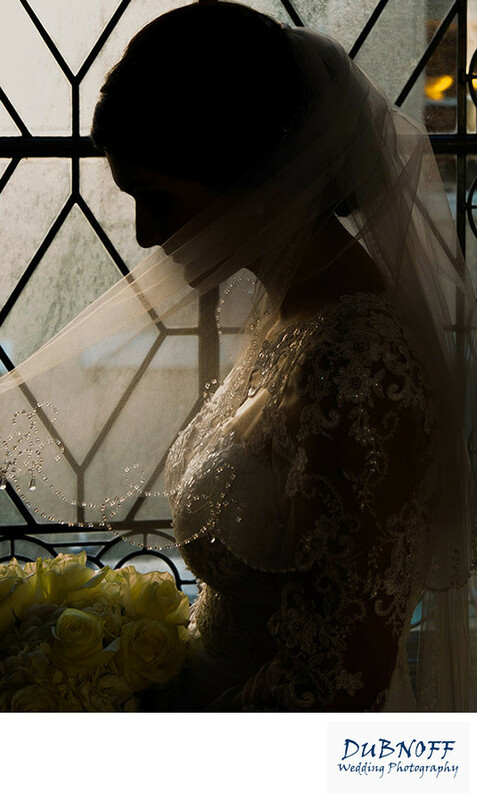 For this particular image we had a bride with an attractive profile, nice subtle flower colors and of course the beautiful veil. Probably the most important factor present in this photo is that it was raining outside. You can see some evidence of this in the window and also how it adds to the beauty of this photo taken in a 3rd floor window at City Hall. My first instinct when making this image was to use some reflective light to bring out the detail in the dress and flowers. However, I ended up just bouncing my flash against the opposite wall on a very low setting to add the small highlights you see in this image.